ClinkAD Native, Popunder, Banner, Teaser advertising network details. 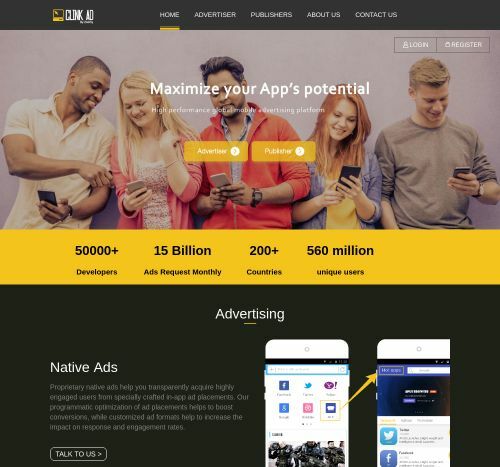 ClinkAd is a Native Ads platform designed to maximize your app's potential and achieve high performance when it comes to the mobile advertising experience. Whether you choose to become an Advertiser or a Publisher, ClinkAd has dedicated solutions according to your plan. With their Native Ads portfolio, you are promised to acquire a big amount of engaged users. ClinkAd is also using Programmatic Optimization that helps users to boost their conversions. ClinkAd has more than 50k developers, 15 billion ads request a month, and it is presented in more than 200 countries. Also, check the reviews on Affbank regarding ClinkAd and the Information section to find out what Pricing Models, Advertising Formats and Targeting options they offer.